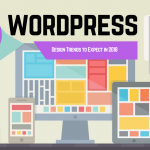 The web is rapidly shifting towards video as the dominant way people consume content, and that has all of us, from bloggers, content writers, to even large publishers scrambling to learn the must have skill in 2018 that is video editing. Yes old dogs can still learn new tricks, but for people who have never done video editing before, the whole affair can appear outright overwhelming. In this blog post I’ll review and go over the 5 best video editing software in my opinion for beginners and people who want to start producing videos for Youtube in 2018 and beyond. 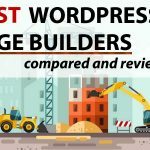 All of them are extremely affordable, takes less than a couple of hours to get a solid grasp of, and have all the main features you need to create very compelling videos in no time. They are also cross platform, working on both Windows and Mac alike. 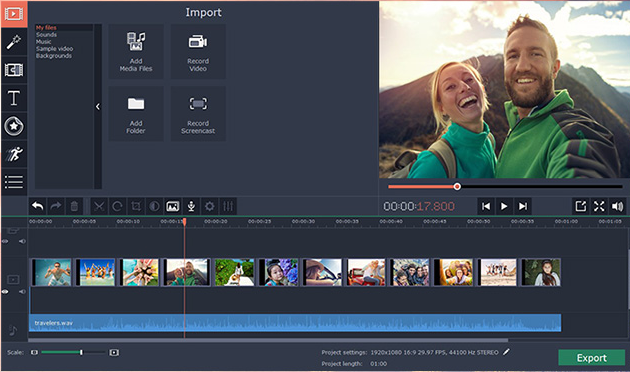 Movavi Editor Plus is a great video editor where users can easily do all the basic tasks of video editing like edit, cut, split, alter and clean up the audio and video tracks. You can spice up your videos with external objects, animation, cool effects, and transitions. You can capture videos from screen or webcam and record audios to create videos in wide format. One of the key features of the software is webcam capture. Video stabilization, beat detection and audio editing tools are handy too. Movavi Editor Plus has successfully compiled all of their important features in just 6 key buttons in the side column. The 6 key features includes importing, animation, filters, texts, transition and special effects. These features help guide your normal videos to professional looking productions. You can animate objects with keyframe and create movements of various elements in Movavi, which gives you granular control over each frame. There are separate audio editing tools to take care of your audio.The media player in the center of the UI shows a clear and accurate video with different transparency levels and a timeline that supports different audios, videos, and the title track. There is something called Smart Montage Wizard in Movavi editor that helps you automate the task of video creation. If you are out of time to edit your videos yourself, then you can add all your photos and video clips in this wizard and this will automatically create a great looking video for you. It works great for Youtube videos that you want to quickly put up for friends and family. Movavi is optimized for multi-core processor and uses technologies like NVIDIA® NVENC and multi-GPU technologies which give it significant gain on performance. The rendering is quick and smooth too. Movavi took 3 minutes and 15 seconds to render a test movie whose duration was under 5 minute. The video editor earns a 9/10 in user-friendliness. It is frankly one of the simplest and most user-friendly video editing software in the market. Even a person trying video editing for the first time can create videos with ease. The interface is simple, clean and well designed with the dark grey layout. $59.95. This price gives you lifetime license on one computer. Movavi Editor Plus comes with handy sets of built-in media collections like videos, stickers and soundtracks.The learning curve is very low. Adding awesome transition and effects is very easy. There are so many different kinds of transitions that you can add to your videos in no time with just a few clicks. I’m not a fan of Movavi’s timeline UI. It quickly becomes very cluttered after you’ve added a lot of effects. Compare that to Filmora below, which is a lot better in that respect. Filmora is another video editor geared towards casual video editors and Youtubers that are willing to relinquish fine control in return for ease of use. When you launch the software you get two modes: Easy Mode and Full Featured mode. Easy mode does not give you much control but you can create videos in just a few minutes by using a set of pre-programmed themes and music. In full featured mode you get much more in depth control over your videos. Full-featured mode gives you access to the timeline and storyboard for editing your videos. One major drawback we found in the Filmora is that it only supports a limited number of video tracks in both Easy Mode and Full Feature Mode. Although with fewer video tracks things become more manageable, it is inadequate for complex projects. The best part of Filmora is the large library of stickers, background music, and text effects that you get instant access to as part of the program. They make creating a compelling video for beginners and the Youtube audience so much easier. Filmora was fast and performed better than most of the other video editing software in its class. Filmora took 2 minutes and 41 seconds to render a test movie whose duration was under 5 minute. Regardless of skill level, anyone can use the software. The interface and workflow are very easy to grasp. All the tools and features are available in the main window. While most video editing software takes hours of learning, Filmora can be used within a few minutes flat. $39.99 for a Year and $59.99 for the lifetime. Due to the small difference it makes sense to just go for the life time license. 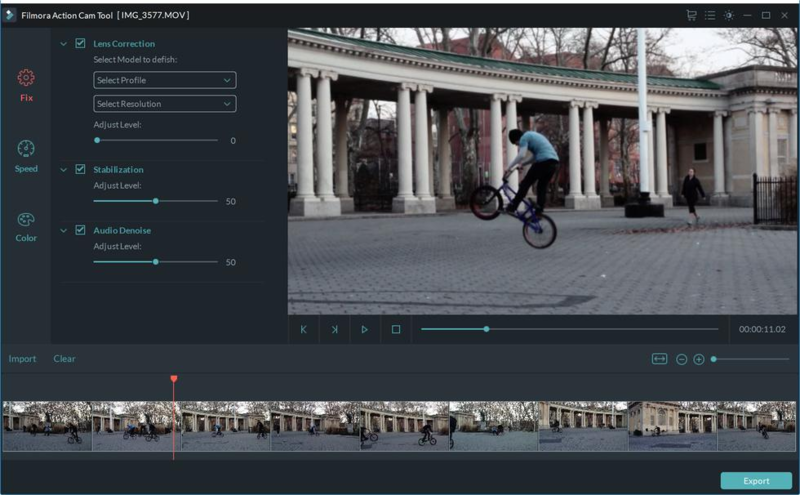 Filmora is another video editor targeted for beginners and casual Youtubers. Easy to learn and use. Pleasing interface with many effects, text tools, filters and good output options. You get minimum control over your animations which makes it less suitable for advanced and professional video editors. It lacks many advanced editing features like closed captions, editing of 360-degree videos, track moving objects and a surround sound configuration. PowerDirector 16 Ultra is one of the best video editing software in the intermediate level market. CyberLink adapts to the latest trends quickly and in version 16 of PowerDirector the company has added support for 360 videos. They are many advanced features in the program, from image stabilization to object tracking and titles designed to work for 360 cameras. Color-matching, look up table, audio ducking are other high end addition to the software. When you purchase the Ultimate Suite, you get access to the latest versions of ColorDirector and AudioDirector. You can preview your videos in HD quality in real time with the HD workflow and pre rendering of clips. This is a powerful and serious video editing tool on the market. PowerDirector 16 Ultra scored really well on rendering speed while being easy on CPU and memory. The software uses TrueVelocity technology to accelerate video processing. On our test it rendered a test movie of 5 minutes in just 2 minutes 31 seconds. Since there are many advanced features, PowerDirector 16 can appear overwhelming to people that are new to video editing. Whether or not you want to devote the extra time to figuring out the interface depends on your anticipated needs. If you’re looking for a program that’s more future proof in terms of features, PowerDirector 16 is an excellent choice. Intermediate to Advance Video Editors. There are four versions of the software: Deluxe, Ultra, Ultimate, and Ultimate Suite with the price ranging from $129.99 to $274. One of the best 360 degree video editor with advanced editor control. Rendering and overeall performance are great. Uses True Velocity technology to enable ultra-fast video production. The motion tracking technique felt a bit awkward at the outset. 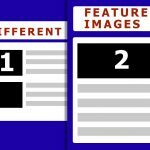 Many features are hard for the beginners to grasp. Adobe Premiere Elements is one of the most popular consumer video editors. A big part of its success derives from the large collection of in house and user generated tutorials that offer a clear path for any beginner to create the desired video effect. There are also tons of Premiere tutorials on Youtube. There are three modes to enter upon launching Adobe Premiere Elements: Quick, Guided, and Expert. Quick view and Expert view are similar to any other video editing software. The unique guided view guides you step by step through the creation of a video. The new Adobe Premiere Element comes with many new features. You can capture still images from a video using a feature called Candid Moments. Adobe uses AI techniques and face recognition to smart trim videos. Adobe Premiere Elements is filled with advanced video effects like chroma-keying, transition, opacity, scaling, picture-in-picture, and key-frame timed effects. Premiere Elements lets you apply video stabilization from either Quick or Expert mode. Premiere Elements lacks hugely in rendering speed. On our rendering test Premiere Element took more than double the time required to render any video compared to PowerDirector. It took 5 minutes and 18 seconds to render our test video of 5 minutes. This is a user friendly video editor with good guidance and support. The Guided modes will help users to learn and create nice-looking videos with absolutely no experience. There are tons of tutorials, documentation and forum to turn to for support. Both experienced and inexperienced video editors. You can get it together with Photoshop Elements for $149.99 or as a standalone app for $99.99. These are one-time fees. It takes up to 1.5 GB of disk space. You will need a powerful computer with multicore CPU and at least 4 GB RAM and 5 GB of available hard disk space. 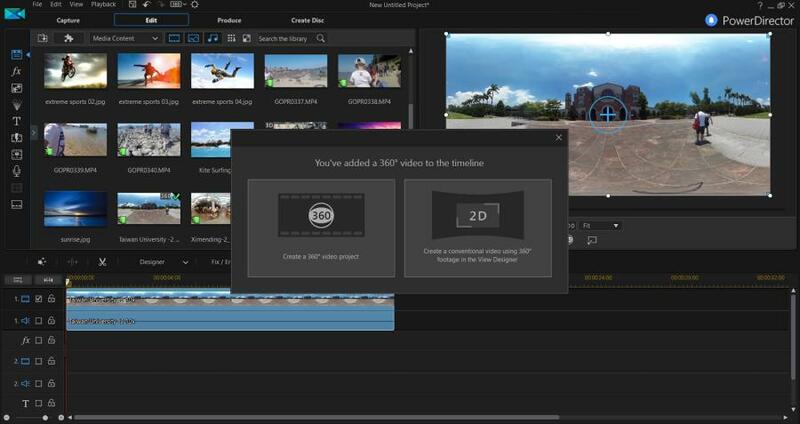 Adobe Premiere’s Guided Edits feature is great for beginners to assist in and learn video creation. Many video effects, solid Text Tools, and powerful Audio editing. It has good control on Stabilization . It lacks 3d editing, Multicam feature or screen recording The rendering speed very slow. Lacks support for new video technologies like 360-degree and VR content. Nero Video 2018 is a decent and affordable video editing tool. It has a rich set of unique features and great support for exporting videos to physical media. The unique workflow and interface does take some time to get used to for someone coming from other video editors. Nero video has two editing modules: Express Editing (storyboard) and Advanced Editing (timeline). When you start building video in Express Editing, you can switch to the Advanced editing later on if you want. In advance Editing you can add unlimited number of editing video and audio tracks. Its library has more than 400 effects, transition and other objects. 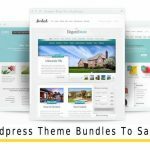 You can also find slideshow creator and many themes and templates to create basic videos. Overall, it’s a very good video editor to create simple videos. Video stabilizer, chroma key and 4k compatibility are very few advanced features Nero Video possesses. The software lacks many advanced features like 3d auditing, action cam module, 360 editing, masking tools and closed caption. It doesn’t perform compression of long videos very well. The render speed was slower too. It took 4 minutes and 50 seconds to render our test video of 5 minutes. 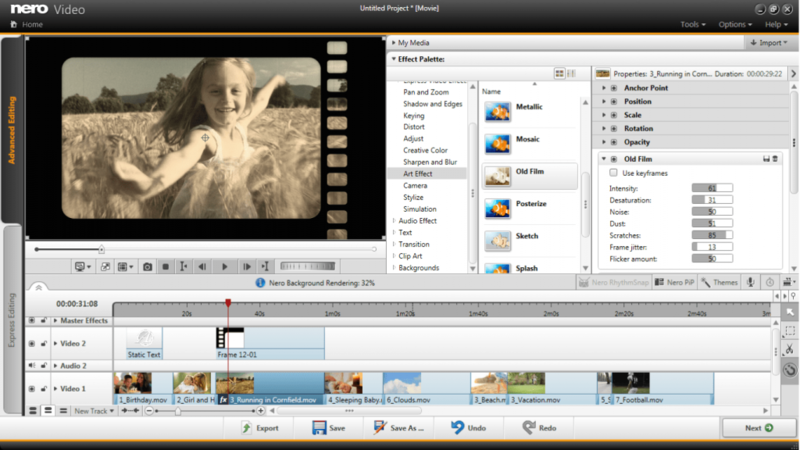 The features of Nero Video editor make it a basic video editor targeted for small and medium projects. 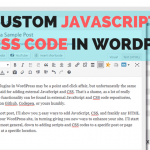 However, its unique interface and layout can be confusing at the start for beginners and even experienced video editors. Nero has online videos, knowledge base and FAQs forum for support, but it’s somewhat difficult to find them. You can call technical support team but it costs $1.29 per minute. Its full version costs €49.95. We love the fact that Nero Video supports unlimited audio and video tracks in its timeline. Tons of enhancement, effects, and transition to create visually appealing videos.Great exporting features to DVD, Blu-ray and CD. Its unorthodox interface and workflow can be confusing at the start. It takes a few hours to master. Lacks many advanced features. Which Video Editor Should I Choose? 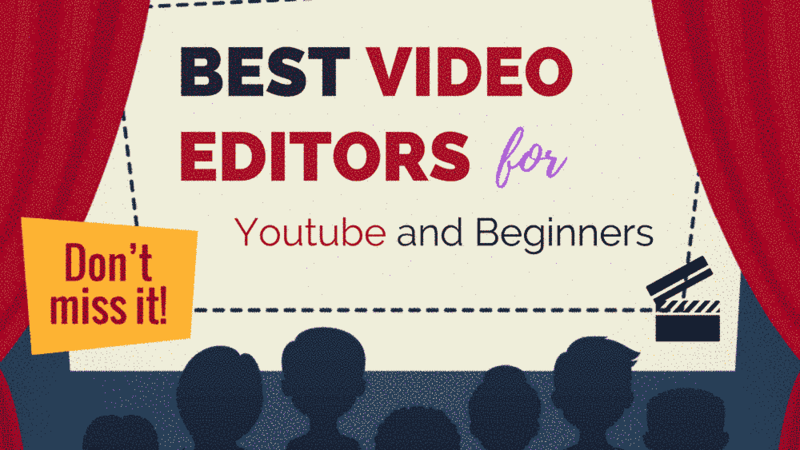 Ultimately all of the video editors covered here make excellent choices for beginners to hit the ground running and start creating captivating videos for Youtube and other platforms. Otherwise they wouldn’t have made the list. From an ease of use and cost standpoint, Movavi and Filmora get our top picks. Adobe Premier is another excellent choice thanks to the large number of tutorials and community, though the higher cost and sluggish performance is a bummer. Cyberlink’s PowerDirector is your best bet if you’re looking for a feature rich video editor that has you covered well into your video editing career. And last but certainly not least, Nero Video makes a great choice for those of you looking for a program that does video editing, slide shows and burn to DVD capabilities well.